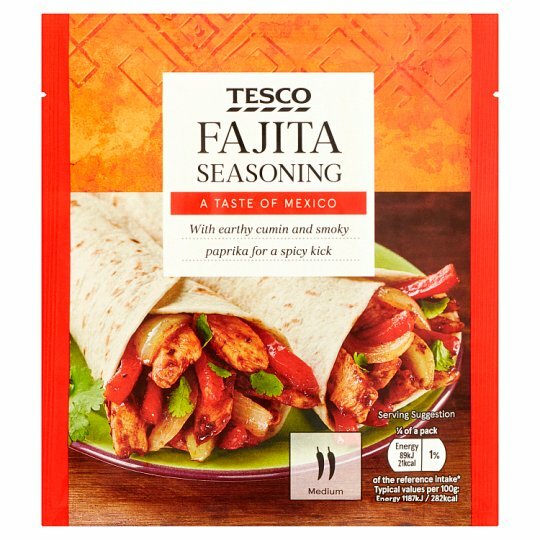 To prepare fajitas you will require: Tesco fajitas seasoning 30g500g chicken breast fillets, cut into thin strips; 1 large red or yellow pepper, sliced; 1 large onion, sliced; 30ml (2tbsp) oil; tortilla wrapsAdditional garnish (optional)Cheese, sour cream, salsa, guacamole.Coat 500g chicken pieces in fajita seasoning and fry until thoroughly cooked. Add 1 sliced onion and a sliced pepper and cook until tender. Perfect inside a Tesco plain tortilla, serve with toppings of your choice e.g. cheese, sour cream, salsa, guacamole.